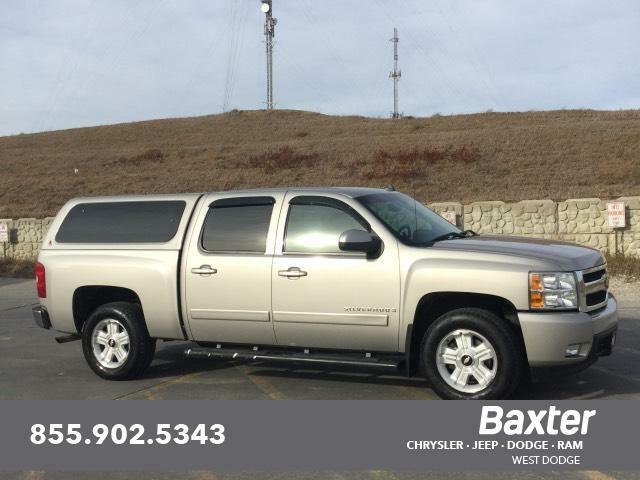 6.2L Engine, HARD TO FIND 6.2L-V8, CREW CAB, LTZ, LEATHER, NEW TIRES!! I bought this truck in 2010 with only 45K miles on it. 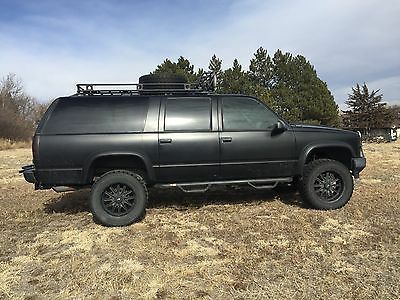 At 85K miles this is probably the LOWEST mileage 1997 Suburban you’ll find! This was a truck that was kept at a friend’s vacation house (celebrity chef Charlie Palmer) so it did not get much use. I’m the third owner of the vehicle, the second owner was my friend who started the build – I bought it from him and completed the build. I LOVE this truck, put $30K as you can see from the build sheet into it but am not using the truck since I travel a lot so here it is for sale. The truck is painted Boyd Codington flat black. We painted the exterior and all the door jams but not the inside of the engine compartment. Taillights were misted over. Overall mechanical condition of the truck is good. Starts every time and runs great with no known mechanical issues or oil leaks. Truck has NEVER, EVER been taken off road, mostly driven around town and to and from Denver. 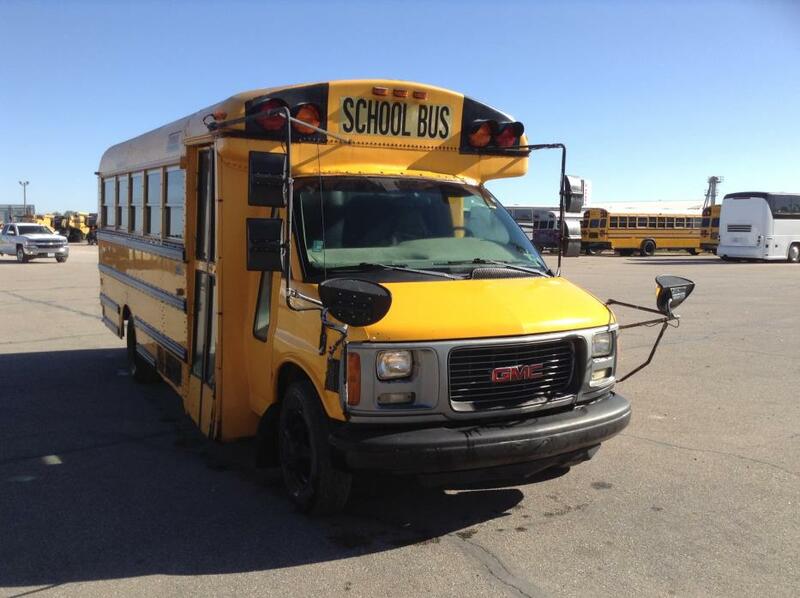 It was my daily driver for four years – very reliable and always properly maintained – oil changed every 3K miles. New transmission in 2011 as part of the build. I have the complete service records since I owned it and most of the receipts from the project. This is a nineteen year old truck so……condition comments that I’d note (see pictures): crease in driver’s side door, touched up hood rust spots, minor rust underneath vehicle, third row seat missing, significant wear on driver’s side seat, rear headliner sagging, and backup camera connection behind stereo keeps coming loose. Tires have about 40K in miles on them so probably 10-15K left. Not a perfect vehicle but looks really cool! No trades, cash only. Purchase requires a $500 PayPal deposit, balance in cash only. Vehicle is located in Sidney Nebraska 69162. Thanks for looking, please let me know if you have any questions. 1997 Suburban Build Truck $4,500.00 Body and Paint $5,125.00 Transport to California $250.00 Hood and Bumpers $650.00 Hitch/Break controller/Wiring $350.00 RBP Steps and Freight $391.00 Suburban Battery $81.58 Floor Mat set $125.00 5” Lift kit/20” Pro Comp rims/ 35” Wheels $3,150.00 Fender Flares $241.00 Programmer $196.00 Rear Diff Cover $230.00 Fluid Exchange $480.00 Magnaflow exhaust/Endlinks/Step install $507.16 Dismount Tires and wheels $125.00 Powder Coat 4 Wheels $400.00 Paint door Jams and Supplies $302.86 Power Window Switch $21.75 Factory Roof Rails $107.31 Powder Coat Bumpers/Bar/Wheel $350.00 New Rear Bumper and pads $295.54 Mounting Plate $11.23 Dash Panel Switches $38.00 Front Bumper/lights/rear lights Install $913.41 License Plate Light $31.58 Roof Rack Bolts $22.03 Alternator $450.00 Alternator adaptor switch $35.90 Safari Rack $453.99 Safari Rack Light Cage $185.99 Safari Rack mounting kit $31.99 20 inch Wheel - on roof $315.25 Rear Pro Runner bar $236.47 35x125.50R20 Tires (approx. 40K miles since new ) $1,540.10 Front Skid Plate $191.99 Front Pro Runner Bar $143.00 Mount Balance and Swap new Tires $30.00 Alignment and Re-Torque $100.00 2 additional 7 inch Lights $107.34 Spare Tire Mount Kit $80.00 four 9" lights and two 7" lights $453.22 Transmission- about 40K since installed $2,300 New windshield - 2014 $200 New alternator -2012 $400 New transmission radiator - 2013 $300 New suspension bushings - 2014 $200 New battery - 2014 $130 Brake pads – 2015 $247 Stereo w/Bluetooth Stereo shop #1 Viper alarm $871.41 Back Up Camera (needs to be plugged in behind stereo) $350.00 Stereo shop #2 stereo, speakers, custom subwoofer $1,670.93 Total $30,873.03 On Feb-07-17 at 12:52:47 PST, seller added the following information: Any questions 954-243-8430 call anytime. Thanks. 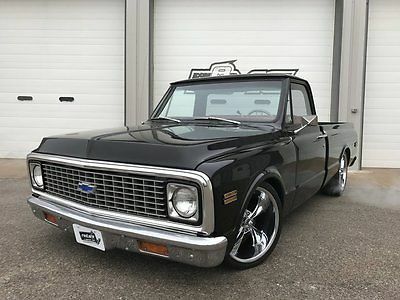 --> Year 1972 Make Chevy Model C10 Color Black Mileage 6,789 Transmission type Automatic Engine 454 V8 Vin CCS142Z133118 Vehicle Description Click Here To View High Res Images On Flickr 1972 Chevrolet C-10 Pickup Shortbox Restored Frame-Off restoration 454 Big Block Chevy with Cam Turbo 400 Transmission Power Disc Brakes Power Steering Gloss black paint Red Leather Interior New Wood bed Belltech lowering Kit 20" wheels and tires brand new Everything is new on this truck from top to bottom, with a show quality paint job! Jump in and drive this truck anywhere. Super sharp and gets a lot of attention. Has a great rumble sound to the exhaust that everyone really likes. The contrasting red leather interior looks outstanding up against the smooth black paint finish! Seller Info Restore a Muscle Car is a full blown restoration shop the specializes in classic auto restoration. Currently over 17 technicians working here on clients car from all over the world. We are a one stop shop that can address every issue from driveline, interior, body/paint, wiring, etc. We not only restore vehicles back to stock but also help in a lot of pro-touring upgrades, fuel injection, adding AC systems, disc brakes, turbos, super chargers, suspension, etc. We are here to help with as little or as much as you need on your old or new car. Checkout our feedback and ebay store for additional products and services! Shipping We can help ship the car anywhere in the world. The buyer is responsible for all shipping charges, but we can help pass along the wholesale rate we get for shipping to you! Bid to WIN! Please email or call us with all your questions or picture needs, so that you can bid to win! This car is for sale locally, so we reserve the right to end early! Payment Financing: Terms of Sale This vehicle is available for sale locally as well, so we reserve the right to end the auction early if needed. The purchaser is responsible for any transport fees, but we can help arrange an open or enclosed carrier to deliver the vehicle to your door at a wholesale rate as well. 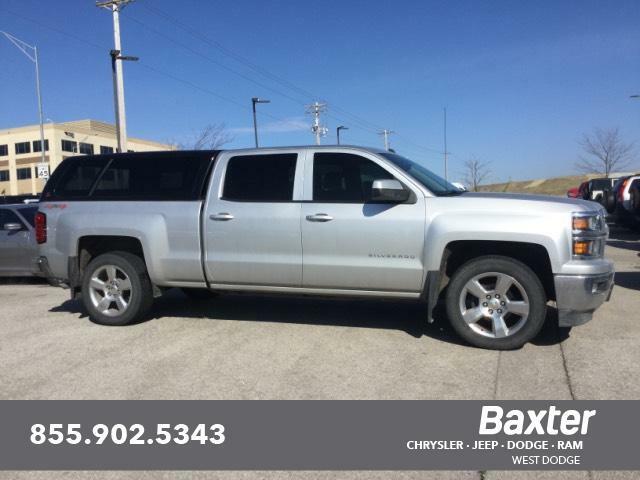 Vehicle is being sold AS IS with NO Warranty, required by law in the state of Nebraska. Thanks! Contact Us Please contact us if you have any questions via phone: 402-465-5756 daytime, 402-730-4719 evenings/weekend. Or ebay messaging! 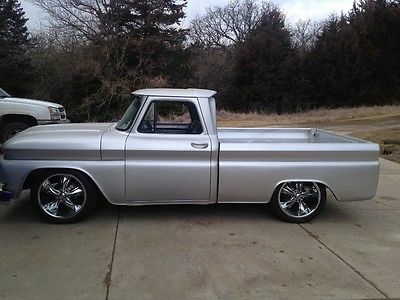 Loaded 1966 Chevy shortbox. Custom paint ,polished aluminum bed, auto meter gauges rear air ride with option of front but currently running Qa1 front coil/shock setup. Wildwood disk and vented rotors 454 with LS-6 heads aluminum intake and a holley carb. 5 speed tremec transmission. Foose rims. 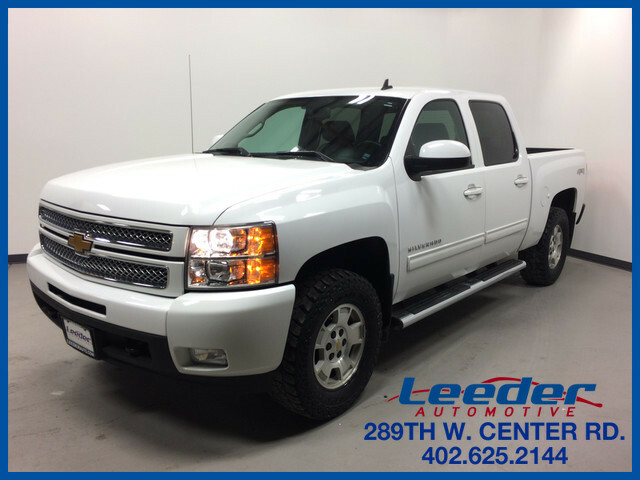 2006 Chevrolet Silverado 2500HD with the LBZ 6.6L duramax diesel & 6 spd allison transmission. 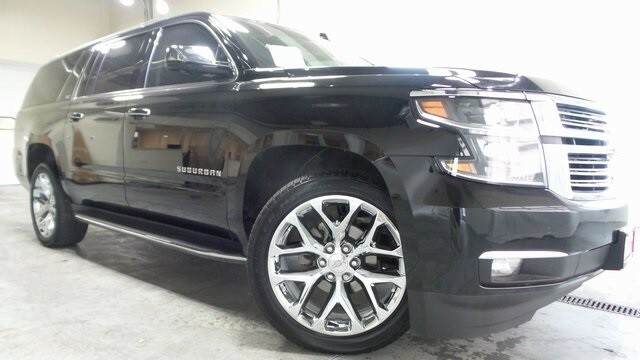 Options Include (but not limited to)heated leather seatsfull power, lumbar driver and passengerXM Sat radio6 disc cdbluetoothhandfree callingUSB media inputcrew cabB&W turnover ballputco bedrailsLuverne stainless steel running boardsBF Goodrich All Terrain T/A tires (fronts are near new & rears are at ~50%)bullydog tuner4x4B&W turnover balltrailer plug in bedonstardual zone climate control I special ordered this truck from the factory, then sold it to a older retired gentleman (friend) when we decided to start a family & build a house, he and his wife used it to pull their camper for a few years, then i bought it back. It has been pampered its whole life and lives in a heated garage. 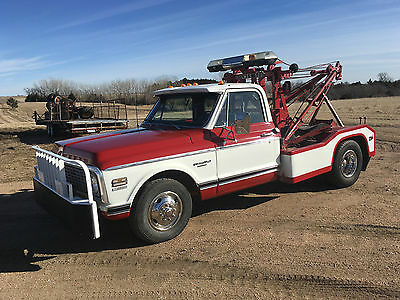 You WILL NOT find a truck in better condition (cosmetically or mechanically) at this age. headliner: perfect, seats & carpet, perfect, all buttons, perfect, dents, good luck finding one. This is as close to factory perfect as you could get for a 2006. Things i added:Bullydog tuner. This is NOT to turn it into a hot rod truck. I put it on for the economy. it will get a consistent 23-24 mpg on highway. i've had as high as 28 with the right fuel and conditions. with the push of a button you can switch between stock, tow, performance, & extreme. I always leave it on performance, unless i'm towing i turn it to tow mode. it seems to get the best economy on performance. Isimple Connect. This is a small module that plugs into the wire harness between the truck and the radio head unit. it turns the sat radio input into more inputs: 2 bluetooth phone links, aux 3.5mm input, usb media input, and original sat xm input. you can control your android or iphone device with your radio and steering wheel controls! also has hands free calling as well with caller ID displayed on the head unit. This is a way to upgrade a "pre bluetooth" era truck into a newer one while preserving the appearance and full functionality of OEM. Very, very neat device. This truck has been my baby. I have another truck I use for my daily driver/work truck. This truck pretty much sits in the heated garage. we use it to pull our wake boat to the lake on the weekends during summer. There are 3 things that need attention:1. needs a new fuel level sending unit. it reads erratically. been like that forever. i always use the fuel counter on the computer to track my fuel level.2. glow plug #1 needs replaced. 3. needs a new thermostat. All of these are simple, relatively inexpensive fixes, i just havent gotten around to it. I took these pics last fall when it was nice outsitde after i washed it. Again, you will be amazed at this truck. it starts, runs, and handles like the day i brought it home from the dealership. 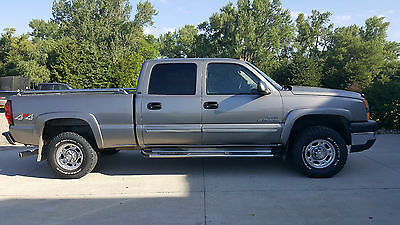 Its time i move into a newer truck so i'm finally letting it go. Make an offer, but please, serious offers only. Please email me with questions. Thanks. 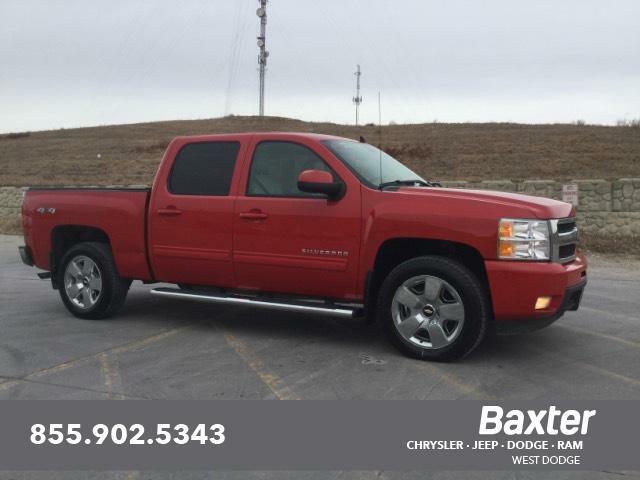 Copple Chevrolet GMC306 Main Street | Louisville, NE 68037 SALES: (866) 457-5561 | SERVICE: (866) 382-8110 Window Sticker2017 Chevrolet TraversePremier AWD VIN1GNKVJKD0HJ256037Engine3.6L V6 engineTransmission6-speed automatic AWD transmissionTrimDark Titanium/Light Titanium, Perforated Leather-Appointed seat trimColorIridescent Pearl TricoatPricingDestination Charge $895.00Total Options SEE DEALERMSRP* $49,905.00Traverse 1LZ Standard Equipment**EntertainmentAudio system controls, rear with headphone jacksAudio system feature, Bose premium 10-speaker system (Upgraded to (UQS) Bose 5.1 surround sound 10-speaker system when (U42) rear seat entertainment system is ordered. )Audio system feature, USB portAudio system feature, auxiliary input jackAudio system feature, dual USB port, charge only, located rear of center consoleAudio system, Chevrolet MyLink radio with Navigation 6.5" diagonal color touch-screen display, AM/FM/SiriusXM radio with CD player, includes Bluetooth streaming audio for music and select phones; Hands-Free smartphone integration with Pandora and Stitcher; voice-activated technology for radio and phone (STD)Color Touch Navigation SystemOnStar 4G LTE and built-in Wi-Fi hotspot connects to the Internet at 4G LTE speeds; includes OnStar Data Trial for 3 months or 3GB (whichever comes first) (Visit onstar.com for coverage map, details and system limitations. Services vary by model. OnStar acts as a link to existing emergency service providers. Not all vehicles may transmit all crash data. Available Wi-Fi requires compatible mobile device, active OnStar service and data plan. Data plans provided by AT&T. 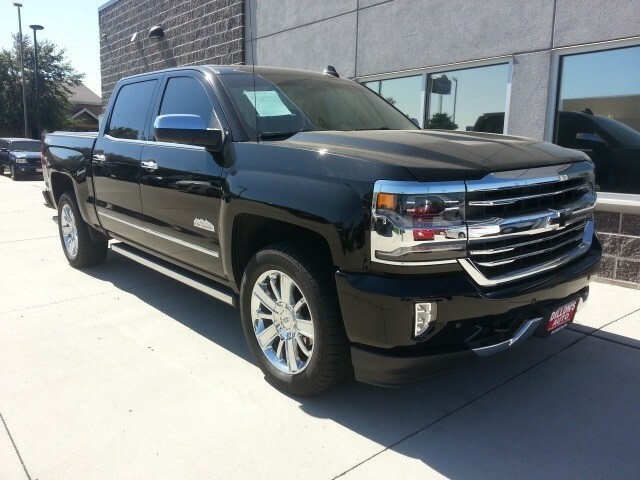 )SiriusXM Satellite Radio is standard on nearly all 2016 GM models. Enjoy a 3-month All Access trial subscription with over 150 channels including commercial-free music, plus sports, news and entertainment. Plus listening on the app and online is included, so you'll hear the best SiriusXM has to offer, anywhere life takes you. Welcome to the world of SiriusXM. (IMPORTANT: The SiriusXM Satellite Radio trial package is not provided on vehicles that are ordered for Fleet Daily Rental ("FDR") use. If you decide to continue service after your trial, the subscription plan you choose will automatically renew thereafter and you will be charged according to your chosen payment method at then-current rates. Fees and taxes apply. To cancel you must call us at 1-866-635-2349. See our Customer Agreement for complete terms at siriusxm.com. All fees and programming subject to change. )ExteriorDoor handles, chromeFog lamps, frontGlass, Solar-Ray deep-tinted (all windows except light-tinted glass on windshield and driver and front passenger side glass)Headlamp control, automatic on and offHeadlamps, dual cavity, halogenLiftgate, rear powerMirrors, outside heated power-adjustable, power-folding and driver-side auto-dimming, body-color with integrated turn signal indicators and driver-side memoryMoldings, body-color with chrome accent bodysideRoof rail moldingsSpoiler, rearTires, P255/55R20 H-rated, blackwallWheel, 17" (43.2 cm) compact steel spare wheel and tireWheels, 4 - 20" x 7.5" (50.8 cm x 19.1 cm) machined aluminumWiper, rear intermittent with washerWipers, front intermittent with washersInteriorAir conditioning, rear manualAir conditioning, tri-zone automatic climate control with individual climate settings for driver and right-front passenger and second/third row controls for second and third row passengersBluetooth for phone, personal cell phone connectivity to vehicle audio system (Upgraded to Bluetooth streaming audio for music and select phones with (UI6) Chevrolet MyLink radio, (UI4) Chevrolet MyLink radio with Rear Seat Entertainment, (UI8) Chevrolet MyLink radio with Navigation or (UI7) Chevrolet MyLink radio with Navigation and Rear Seat Entertainment. )Cargo storage, tray under rear floorConsole, front center with 2 cup holders, covered storage bin and sliding armrest with storageCruise control, electronic with set and resume speedCup holders 10 with (ABB) 7-passenger (2-2-3 seating configuration) and 12 with (ABC) 8-passenger (2-3-3 seating configuration)Defogger, rear-window electricDoor locks, power programmable with lockout protectionFloor covering, color-keyed carpetingFloormats, color-keyed carpeted front, second and third row, removableInstrumentation, enhanced Driver Information Center with personalization features, speedometer, tachometer, outside temperature display, low oil, fuel and coolant indicators, odometer, trip odometer and trip computer with digital compassInsulation, acoustical packageLighting, interior with theater dimming, cargo compartment, reading lights for front seats, second row reading lamps integrated into dome light, door-and tailgate-activated switches and illuminated entry and exit featureMemory Package includes 2-position memory for driver's seat and outside rearview mirrorsMirror, inside rearview auto-dimmingNavTraffic Avoid congestion before you reach it by enhancing your vehicle's navigation or entertainment system with NavTraffic. With detailed information on traffic speed, accidents, construction, road closures and more, you will get to your destination faster and more easily than ever before. (SiriusXM Satellite Radio and NavTraffic subscriptions are sold separately or as a package after trial period. If you decide to continue service after your trial, the subscription plan you choose will automatically renew thereafter and you will be charged according to your chosen payment method at then-current rates. Fees and taxes apply. To cancel you must call us at 1-866-635-2349. See our Customer Agreement for complete terms at siriusxm.com. All fees and programming subject to change. NavTraffic available only in select markets. For more information, see siriusxm.com/navtraffic. )Rear Park AssistReclining front buckets (STD)Remote Keyless Entry, programmable with 2 transmitters, panic button and extended rangeRemote vehicle start with extended range Remote Keyless EntrySeat adjuster, passenger 8-way powerSeat trim, perforated leather-appointed on first and second rows (Includes (KB6) heated and cooled driver and front passenger seats and (AH8) 8-way power passenger seat adjuster. )Seat, 8-way power driver with power recline and lumbar control and memorySeat, third row manual 60/40 split-folding benchSeating, 7-passenger (2-2-3 seating configuration) with 2nd row flat-folding Captains Chair and third row 60/40 split flat folding bench seat (STD)Seats, front, heated and cooled driver and passengerSteering column, tilt and telescopic with brake/transmission shift interlockSteering wheel, heatedSteering wheel, leather-wrapped with mounted cruise and audio controlsTrim, interior, wood grain center stack and interior trim (Includes wood grain passenger door trim. )Universal Home Remote includes garage door opener, 3-channel programmableVisors, driver and front passenger padded with cloth trim, color-keyed and illuminated vanity mirrorsWindows, power with driver Express-Up and -Down and passenger Express- DownMechanicalAll wheel driveAxle, 3.16 ratioBattery, high capacity 660 cold-cranking ampsBrakes, 4-wheel antilock, 4-wheel discEngine, 3.6L SIDI V6 (288 hp [214.7 kW] @ 6300 rpm, 270 lb-ft of torque @ 3400 rpm [364.5 N-m] with dual exhaust) (STD)Exhaust, dual with bright tipsGVWR, 6459 lbs. (2930 kg) (CV14526 AWD models only. 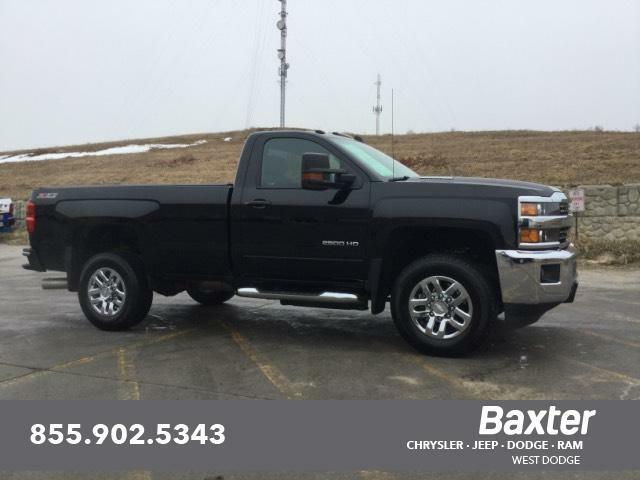 )Steering, power, variable effortSuspension, Ride and HandlingTransmission, 6-speed automatic (STD) (Included and only available with CV14526 AWD models. )Safety-ExteriorDaytime Running LampsSafety-InteriorAir bags, front passenger air bag suppression (Always use safety belts and child restraints. Children are safer when properly secured in a rear seat in the appropriate child restraint. See the Owner's Manual for more information. )Air bags, frontal and side-impact for driver and front passenger, driver inboard seat-mounted side-impact and head curtain side-impact for all rows in outboard seating positions (Always use safety belts and the correct child restraints. Children are safer when properly secured in a rear seat in the appropriate child restraint. See the Owner's Manual for more information. )Door locks, rear child securityForward Collision Alert and Lane Departure WarningHorn, dual-noteOnStar Basic plan for 5 years includes limited vehicle mobile app features, Monthly Diagnostics Report and Dealer Maintenance Notification (Basic Plan available for 5 years from the date of vehicle delivery and is transferable. Does not include Emergency, Security or Navigation services. )OnStar Guidance plan for 3 months, including Automatic Crash Response, Stolen Vehicle Assistance, Roadside Assistance, Turn-by-Turn Navigation, Advanced Diagnostics and more (trial excludes Hands-Free Calling) (Fleet orders receive a 6-month trial. Visit onstar.com for coverage map, details and system limitations. Services vary by model. OnStar acts as a link to existing emergency service providers. Not all vehicles may transmit all crash data. 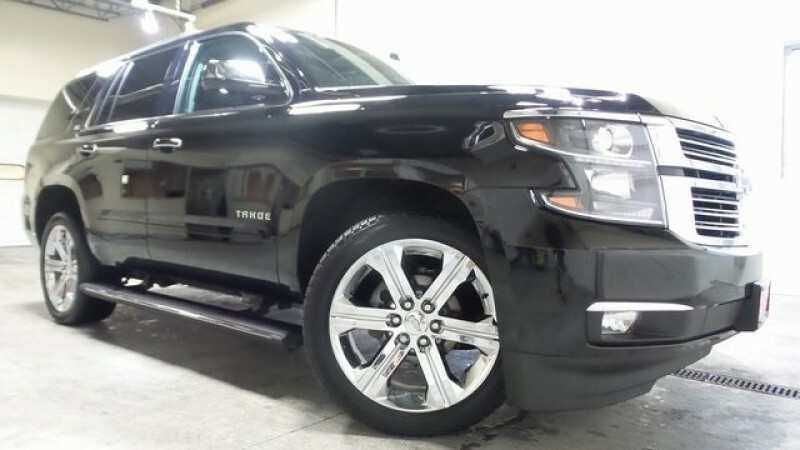 )Rear Vision Camera display integrated into Color Touch RadioSide Blind Zone Alert and Rear Cross Traffic AlertTire Pressure Monitoring System (Does not monitor spare. )Safety-MechanicalStabiliTrak, stability control systemTraction controlWarrantyBasic: 3 Years/36,000 MilesDrivetrain: 5 Years/60,000 Miles Qualified Fleet Purchases: 5 Years/100,000 MilesCorrosion: 3 Years/36,000 Miles Rust-Through 6 Years/100,000 MilesRoadside Assistance: 5 Years/60,000 Miles Qualified Fleet Purchases: 5 Years/100,000 MilesMaintenance: 2 Years/24,000 Miles 2 visitsWhile every effort is made to assure this information to be accurate, variations in the manufacturing process, dealer installed accessories and mileage figures may cause this window sticker display to vary from that on the vehicle. Check with your dealer for complete information. * Manufacturer's Suggested Retail Price. Tax, title, license, dealer fees and optional equipment extra. 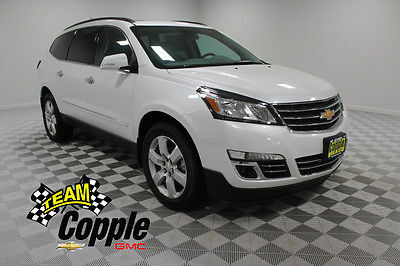 **The features and options listed are for a New 2017 Chevrolet Traverse AWD Premier and may not apply to this specific vehicle.